A bit of freezer magic will have your pup stuffing his face into his canned food for months to come. Sometimes those big cans of dog food prove to be too much for your pup to finish in short time. Rather than tossing them in the trash after a few days, storing the food in your freezer can save you some cash, but only if you do it properly. Open the can and remove the food. Sticking the can in the freezer is one of the worst things you can do. Think of keeping a soda bottle in the freezer overnight. You'd have quite the sticky situation on your hands, because the liquid would have expanded and made for an exit out of the bottle. The same thing happens with canned dog food. Although it's not all liquid, the moisture content typically hovers around 75 percent. Plus, keeping the food in only the can, even with plastic wrap over top, will likely lead to a quick case of freezer burn. 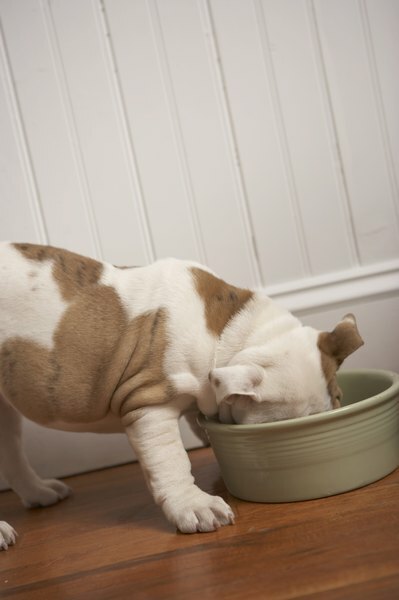 Cut the food into meal-sized portions if you plan on freezing it for your pup's future meals. The portion size depends on your little guy's feeding requirements. Slide the portions into a plastic bag. You can separate each portion into separate bags or stuff as many as you can into as few bags as possible. If you take the latter route, leave enough space between each portion so they don't fuse together and make your life miserable later on when you're separating them for you pup's mealtime. Slice the wet food into small bite-sized pieces and put them into ice cube trays. This works well if you're planning on feeding you’re your little guy his food as frozen treats. You can also stuff the food into a bone and put that into the freezer, or even place the bite-sized pieces into bags, separating them as you would his meal portions. Slide the food into the freezer. If you're sticking bags of portioned food in there, be gentle and place the bags in an area where they won't get bumped or tossed around, at least for the first few hours. You don't want the portions to bind together as one giant chunk of food, although your pup might enjoy that. Remove the food from the freezer and thaw meal portions in either warm water or in the microwave. If you pop them into the microwave, heat them so that they're lukewarm at most. Stick your finger in the food at a few different spots to make sure it's barely warm throughout. If you plan on tossing bite-sized treats into your pup's mouth, or giving him a food-stuffed bone, don't worry about thawing anything. He'll enjoy the snack frozen. If you just opened a can of food, you don't need to freeze it right away. You can keep the food in your refrigerator for up to seven days. Although frozen food does not go bad, as in spoiled or bacteria-infested, its quality will change overtime. Your pup may not eat food that's been frozen for a long period of time. While there's no definite timetable as to how long is too long, you can try gauging that yourself. Leave a meal portion of food in the freezer for a month and see if your pup will eat it, and then two months and so on. That will give you an idea of how long the food will stay edible, at least according to your dog. Use freezer bags to preserve the food longer.